Soon, down here in the south, winter will slip in and the days will become shorter, darker and colder. Although we do not get as severe a winter here as in more southerly areas there are times when the frost falls.Evenings are most decidely crisper. 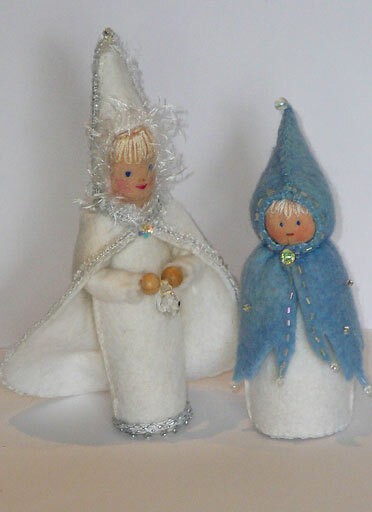 Thinking about the chill of the season, and of winters past, these little frosty characters emerged. The Winter Queen is made from my pattern of the Grass child, from an earlier post. The small winter sprite was designed as a project for our craft group, to be used as story prop or for the seasonal table. They have become very much the like the traditional Waldorf gnome in style, though that was not the original intent. Glass beads and shimmery threads are used to give an ice or dew effect. To get the right look and scale I did have to recourse to some man-made fibres, sometimes the right effect necessitates a deviation from using natural fibres. Children love bling and lots of glitter, nature uses it to draw our attention. I really enjoyed fossicking in the bead box, as I did when I visited my grandmother as a child, so this was indeed a reflective undertaking. Oh my, I love that term “fossicking.” I’m going to have to remember that. Lovely crisp, breezy sprites.